Born: 28 February 1866, Bathurst, New South Wales, Australia. Died: 10 September 1958, Durban, South Africa. George Alfred Denny, older brother of Harry S. Denny*, studied at the Ballarat School of Mines, University of Melbourne, graduating in 1890. He then worked as an engineer in the United States, Canada, South America and Hungary. He came to South Africa in 1892, working in mining and construction at various places in the Transvaal. In 1893 he wrote a brief report, published in Pietermaritzburg, on the "Denny-Dalton gold fields", a gold-bearing banket formation in the district of Vryheid, KwaZulu-Natal. That same year he became a foundation member of the Australian Institute of Mining Engineers, as well as a member of the American Institute of Mining Engineers and the North of England Institute of Mining and Metallurgy. From 1895 to 1897 he was consulting engineer to Creewell & Symons of London and Johannesburg. During the latter year he started as consulting engineer to G. & L. Albu of the General Mining and Finance Corporation, with responsibility for some ten mines. Around this time he published "Notes on an examination of a mine in the Klerksdorp district, ZAR" in the Transactions of the Institution of Mining and Metallurgy (1896-1897). His brother Harry was in partnership with him for several years. 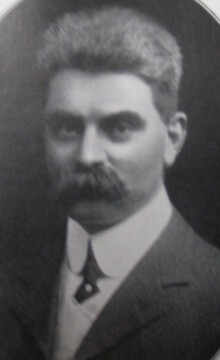 Denny joined the South African Association of Engineers and Architects in January 1898. However, on 29 September the previous year he and E.J. Way* had already read a paper before the association, on "The 'Bladray' electric drill", developed and patented by Way and others (Proceedings, 1897-1898, Vol. 4, pp. 24-45). At the next meeting, on 27 October, Denny read a paper on "The location of deep level shafts", dealing mainly with the cost-effectiveness of various approaches to choosing the location of mine shafts (pp. 60-75). He was president of the association in 1905-1906 (its name had by then changed to the South African Association of Engineers), having been vice-president the previous year. In 1902 he became a foundation member of the South African Association for the Advancement of Science, and at its second annual meeting, held in Johannesburg in 1904, delivered a paper on prospecting with diamond drills (Report, 1904, pp. 332-356). He also served on the committee for Section C of the association that year. In 1905 he joined the British Association for the Advancement of Science when it met in South Africa. Denny was a British citizen. In 1903 he married Winifred Bennett of Durban and in 1906 left South Africa for London. In 1909 he was awarded a United States patent for an improved ore grinding machine. Later he worked in America, but by 1935 was back in South Africa, where he applied for rights to prospect in Zululand. He settled in KwaZulu-Natal, where he died. He was elected a Fellow of the Royal Society of Arts in 1934. Draper, J.R. The engineer's contribution; a history of the South African Institution of Mechanical Engineers, 1892-1967 (p. 245). Johannesburg: South African Institution of Mechanical Engineers, 1967. Google scholar. http://scholar.google.co.za Publications by G.A. Denny. National Automated Archival Information Retrieval System (NAAIRS). http://www.national.archives.gov.za/naairs.htm Documents relating to George Alfred Denny / G.A. Denny. Obituary: Mr G.A. Denny. Journal of the Royal Society of Arts, 1858, Vol. 106, p. 885.